Deploying a Web API with the MIKECore provider. 2. Host in a 64-bit environment. How to allow special characters (for example ":") in a URL? How to allow for a dot (".") in a URL? Which type of connection shall I choose? How do I configure Swagger to incorporate the XML-annotations for a Web API? By default, ASP.NET uses shadow copying, which enables assemblies that are used in an application domain to be updated without unloading the application domain. Basically, it copies your assemblies to a temporary folder and runs your web app from there to avoid locking the assemblies, which would prevent you from updating those assemblies. However, the MIKECore provider is depending on native (C++) DLLs, and as ASP.NET doesn’t copy the native DLLs, you have to turn off shadow copying. Using this configuration option will result in the DLLs being locked when the app is running. So if you need to update a DLL, you will need to take the application offline or stop the process before you can do so. Furthermore, The MIKECore provider is depending on assemblies running in a 64-bit environment only, so to configure a Web API with the MIKECore provider hosted in IIS, you must run IIS in 64-bit mode. By default, there are a number of special characters that ASP.NET does not allow before the "?" in a URL - for example colons (":"). To allow for special characters like ":" in the URL, override the defaults by adding a requestPathInvalidCharacters attribute to the <httpRuntime> element in your web.config without the special character that you want to allow. In some situations, you need to specify a dot (".") in the URL. For example, when using the OpenXML provider, the spreadsheet ID is the filename - including the extension (.xlsx). By default, ASP.NET does not like this. Add a <modules> element to your web.config and set the runAllManagedModulesForAllRequests attribute to true. However, setting RAMMFAR to true has some implications. Instead, consider adding an alternative HTTP handler as described below. Add an alternative HTTP handler to your web.config file. If you have a combination of multiple web APIs within one project, for example spreadsheets and GIS, it is probably not a good idea simply to set the path attribute to "*". Instead, set the path attribute to "api/*" or add multiple explicit handlers. The Domain Services Web APIs are configured using so-called Connections. There are different types of connections for accessing time series, feature collections, spreadsheets etc. But even within the individual domains - for example time series - there are multiple connections to choose from. If you have installed the Time Series Web API nuget package (DHI.Services.TimeSeries.Web) in your project, then you will have the following options, when selecting a time series connection type. Which one to actually choose depends on the circumstances - for example which repository type you intend to use, because all repository types does not necessarily support all connection types. For example the Dfs0TimeSeriesRepository does not support adding a new time series or organizing the time series in a hierarchy of groups, so it only works with the TimeSeriesServiceConnection and the DiscreteTimeSeriesServiceConnection, but is not compatible with any of the other connection types. When using the API Administrator, it will automatically detect the available (installed) repository types that are compatible with the selected connection type. TimeSeriesServiceConnection. This is the simplest form of a time series service connection. It has a quite comprehensive API, but it is all read-only functionality. All time series repositories supports this connection type. DiscreteTimeSeriesServiceConnection. This connection type assumes that the underlying time series repository comprise a finite (discrete) number of time series. This is not always the case. For example in the dfs2TimeSeriesRepository, a time series can be extracted using the geographic coordinates. So a dfs2-file comprises an in-finite number of time series. Assuming that the repository comprises a finite number of time series, the API can be extended with methods like Count, Exists, GetAll, SetValues etc. GroupedDiscreteTimeSeriesServiceConnection. This connection types assumes that the underlying time series repository supports organizing time series in a hierarchy of groups. Under this assumption, methods such as GetByGroup and GetFullNames can be introduced in the API. This is the case for example in the MIKE OPERATIONS time series repository and certain file-based repositories. UpdatableTimeSeriesServiceConnection. 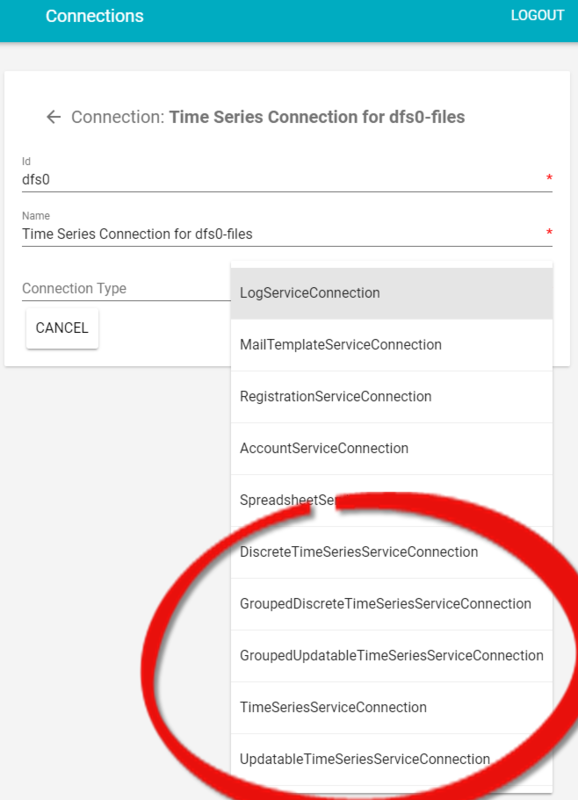 The updatable (and disctrete) time series connection adds methods like Add, Remove and Update to the API. Grouping is not supported. An example of a repository supporting this connection type is the WaterForecast TimeSeriesRepository. GroupedUpdatableTimeSeriesServiceConnection. This connection type comprise everything from the UpdatableTimeSeriesServiceConnection and adds grouping (GetByGroup and GetFullNames etc.) to the API. An example of a time series repository that supports this connection type is the dfs0GroupedTimeSeriesRepository. Within other domains such as GIS, Rasters, Spreadsheets etc. a similar approach is used. When using the Visual Studio project templates, by default, most of the Web API project templates come with swagger support and are configured to use the XML-annotations of the Web APIs that are included in the template. However, if you use one of the generic templates, where you add additional Web APIs to the project, you have to manually configure Swagger to use the XML-annotations of these added Web APIs. This is done in the SwaggerConfig.cs file found in the App_Start folder. In the below example, the XML-annotations of the Time Series Web API are incorporated in the Swagger documentation.